Just around seven years ago I wrote a very similar "In Box/First Look" review of the Italeri 1/35 ELCO 80' PT Boat (late style). I remember thinking at the time, how great it would be to have an equally well-detailed kit of this iconic PT boat in 1/48. To me, and as others have voiced, 1/72 is just a little to small to do this subject justice and 1/35, although well detailed, is a bit large when considering display space, especially if Merit, like Italeri, does a series of these small combatants. Actually, and logically, I understand that Merit already has the early style ELCO 80 footer (PT-103 thru PT-196) in development, but unlike previous kits of this subject it will be generic and not just the PT-109. As for the history of the American PT boat, I again refer you to the above link to the review I did of the Italeri 1/35 kit. However, to summarize that history, the development, production, and operational use of these small boats by the US Navy is spectacular considering it only lasted a little less than six years (1939 to 1945). Likewise, the outstanding combat record of these sleek heavily armed boats and their fearless crews epitomizes John Paul Jones famous quote, "I wish to have no connection with any ship that does not sail fast for I intend to go in harm's way." As noted above, the history of the American PT boat was a short one and in the beginning, not a welcome one. Traditional-minded Navy brass, known as "Battleship Admirals", were of the opinion that the Motor Torpedo Boat (MTB) was merely a novelty and had no place in the real Navy. However, the Navy did have its visionaries who saw the potential of these small combatants; also, they had help from an unusual source in the form of a top ranking US Army officer, four-star General and former Army Chief of Staff Douglas MacArthur. MacArthur recognized in the latter part of the 1930s, that Japanese expansion in the Pacific could potentially result in hostilities between the US and Japan. He also knew that the Navy did not have the resources to counter the growing threat, especially when it came to defending the Philippines. As a result, he pushed the Navy to develop a fleet of heavily armed, easy to build, high-speed motor torpedo boats. MacArthur succeeded in getting the PT boat program going, but unfortunately, at the time that war with Japan broke out only a half dozen boats were deployed to the Philippines. However, these few examples more than proved their worth and as a result would lead to the development of what is considered the definitive American PT boat, and subject of this kit, the late type ELCO 80 foot MTB. Overall, this very straightforward kit looks to be a reasonably easy build to a modeler with experience. Accuracy wise, when compared to several sets of drawings, it looks good. The hull is a one piece casting, as are the deck and the forward and aft cabins. The rest of the parts are arranged on fourteen separate trees/sprues (five of which are repeats) along with one fret of photo etch and a sheet of clear, pre-cut, PVC windows. As far as fine detail, the parts look very acceptable, although I did see some areas that could use some enhancing. It should be noted at this point that some of the molded parts are both small as well as delicate and when combined with the general nature of working with photo etch this kit could be a bit of a challenge to those with lesser experience. Construction of this kit is very similar to the Italeri offering, in that almost all of the construction is a series of individual subassemblies. To me, the nice thing about the subassembly approach is that it is considerably easier to build and paint the separate units while not having to be concerned with masking or disturbing surrounding surfaces or other assemblies. Of course, being an initial overview I cannot judge how well the parts fit. However, a quick check of joining the two main cabins to the deck resulted in an almost flawless and seamless attachment. As for the instructions, the 16-page booklet is extremely well illustrated and very easy to follow. As a side note, the first item in the assembly sequence is to drill out a series of attachment holes on the underside of the deck, (sixty-five in total). Obviously, the deck is common to both the late and early type ELCO 80 footer and includes partially drilled holes for both types. To make sure I do not inadvertently open the wrong hole I plan to take a fine tipped Magic Marker and, following the pattern in the instructions, carefully and accurately circled each hole that needs drilling out prior to actually doing it. You might say that the old carpenters rule of "measure twice, cut once" is appropriate in this case. The kit contains a single 4"x5" decal sheet. This sheet consists of six rows of zero thru nine standard US Navy white numbers with black shadows. Two of the rows scale out to 20 inches tall, while the other four scale out to 8 inches tall. Next are various white hull depth markings along with a choice of two American flags, one flat and one waving. However, I should note that neither of these flags are usable in that they have the current 50 stars on them. For those of you who might not be that familiar with US history, the American flag had 48 stars on it during WWII and did not increase to 50 until 1959 when both Alaska and Hawaii became states. Finally, the only negative I encountered with this kit is the painting guide. 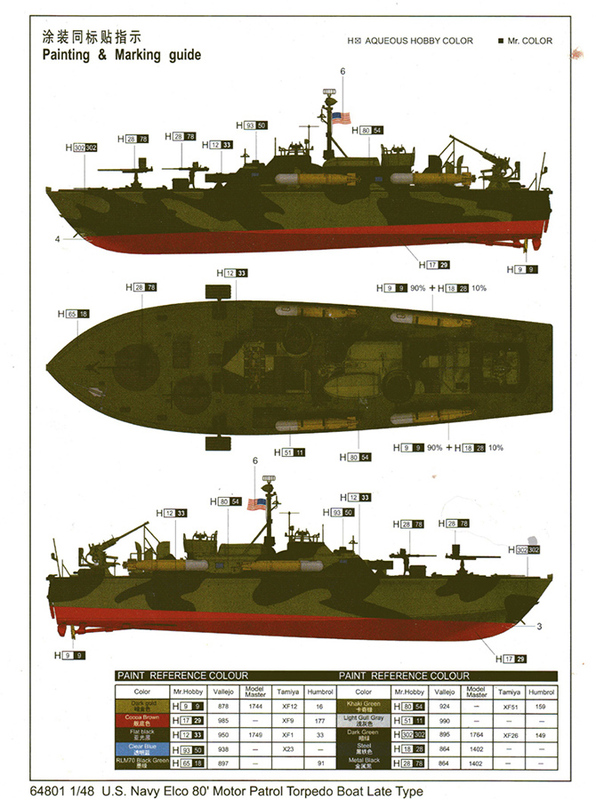 The kit comes with a one page colored three-view drawing that references the US Navy's measure 31/ camouflage pattern 20L for late war PT boats. Although okay as an overview, this guide is a bit hard to follow and general in nature. Specifics, such as the interior of the turrets, etc are not addressed and there are no painting or color references provided in the assembly instructions. Considering the level of detail in this kit, to me the guide leaves a lot to be desired. Likewise, the references to various paint manufactures and actual colors needed are thin at best. For what it is worth a quick search of the internet for US Navy WWII camouflage standards, including colors resulted in the following excellent Wikipedia reference (please note that the color chips you want are close to the bottom). This look to be a good kit on first inspection, and I certainly would recommend it to anyone who asked me about it. However, several areas could use more details especially in and around the cockpit. For example, there are no gauges provided on the decal sheet for the engine instrument panel. Likewise, various other items such as the switch box for the boats lighting, radio/communication hardware, and other miscellaneous boxes like a first aid kit, are missing. Certainly not fatal flaws, but would be nice to have. Also, and as I noted above, the lack of detailed painting information is disappointing. That said, I hope that when I do a build review I will be able to address these items more specifically along with photos as I go along.